External Funds Transfer is the online product that you need to move money to and from Dort Federal. It lets you set up one-time and recurring transfers to and from nearly any financial institution. Standard transfers take 3 to 4 business days to complete. Premium transfers take 1 business day. There is also a service within External Funds Transfer called Popmoney. The Popmoney service is a feature allowing you to send a small payment to someone you know; a child away at school, your gardener, etc. All you need to know about the person is their e-mail address. Upon initiation of a send money payment, we will collect the money from you. Once we have the funds secured, we will notify your recipient that money is waiting for them with instruction on how to retrieve the funds. We will then electronically deposit the funds to an account your recipient specifies. To register and start using the service, login to Online Banking, click on the “Transfer Funds” link and then click on the “External Funds Transfer” link. Once you are registered you can start setting up and validating your accounts. How much does External Funds Transfer cost? Standard transfers take 3 to 4 business days. Premium transfers take 1 business day. What is the maximum amount I can transfer? What do I have to do to “validate” my accounts? 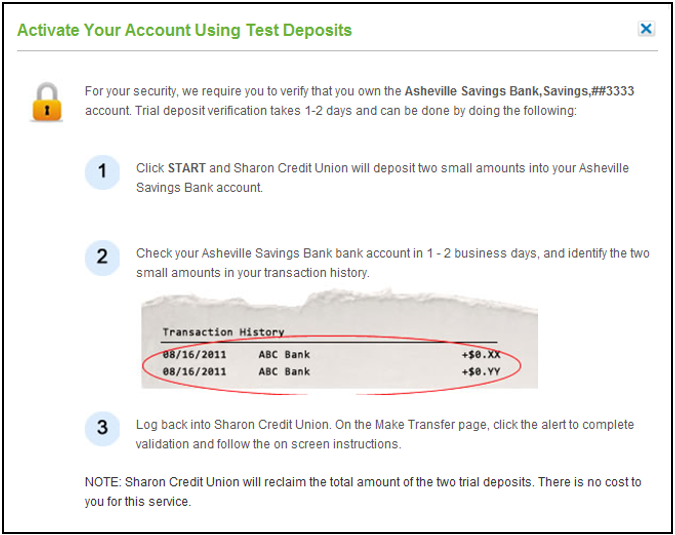 When you set up a new account, the system will make 2 small deposits into that account. You note the amounts of the deposits and then go back into External Funds Transfer. You input those amounts into the system to show that it really is your account. What if I don’t know the routing and transit number for the financial institution I am trying to transfer from? You can search for the financial institution in the External Funds Transfer system. If it’s not in the system, then you will have to call the bank or find the number on their website.